We at Teeming River Cruises want to do everything we can to make sure your trip is as enjoyable as possible. We look forward to having you as a guest and wish to provide you with the details of the Terms and Conditions of your travel with us. Please read the following details carefully, as the payment or purchase of any travel services offered by Teeming River Cruises constitutes a contractual arrangement between the passenger (you) and Teeming River Cruises, and represents your acceptance of the Teeming River Cruises Terms and Conditions. All prices are per person in US Dollars based on double occupancy (2 people sharing a room) unless otherwise stated. Prices are capacity controlled. Items not included in the published price include, but are not limited to, airfares to and from destination, transfers, passport and visa fees, insurance (health, accident, baggage, or travel protection plans), items of a personal nature such as laundry, spa and salon services, mini bar purchases, food outside of the contracted Teeming River Cruises regular menu as presented on board vessel, alcoholic beverages and soda, gratuities, along with other items of a personal nature. Shore Excursions and city apps are not included in the cruise price as well as foreign port taxes unless specifically indicated in the package inclusions. Teeming River Cruises reserves the right to vary cruise prices at any time, in its complete discretion, to account for any increase in costs, including but not limited to exchange rate fluctuations, fuel, government taxes, and charges, or other unforeseen economic circumstances. If Teeming River Cruises has received the full payment for your cruise, there will be no increases in your cruise price, regardless of any increases in the cruise costs inside or outside of our control. If you have not paid the full amount of the cruise fare, and we must vary your cruise price due to an increase in cruise costs outside of Teeming River Cruises’ control, any increase Teeming River Cruises applies to the cruise price will be only to the extent required to meet such additional costs. In any case, no price change can be made in the 30 days preceding the departure. In case of electronic, clerical, printing or human error, Teeming River Cruises reserves the right to re-invoice for the correct price. A full refund will be issued to passengers who choose not to pay this corrected price, provided Teeming River Cruises receives a written cancellation notification within five days of the notice of the price increase. A nonrefundable, per person deposit of at least 50% of the rental fee (i.e. cruise fare) is required at the time of booking. Payment in full is due at least 90 days prior to departure and secures the reservation. If there is an outstanding balance by the final payment due date listed on passenger’s invoice, passenger’s reservations, including all services, will be subject to automatic cancellation. Once canceled, a service reinstatement fee of $50 will be added to passenger’s invoice and must be paid in advance to apply for a reconfirmation of booking. In order to bring Teeming River Cruises’ low prices directly to the consumers, all cruise payments are non-refundable. We wish our passengers never had to cancel or interrupt their cruise, but once in a while things beyond their control force them to change their plans. Teeming River Cruises teamed up with RoamRight, a leading travel insurance brand to address these concerns. Although this protection plan is optional, it is strongly recommended. Any travel insurance purchased is nonrefundable once paid to Teeming River Cruises. Visa, MasterCard, American Express, Discover, US Dollar check, bank check, and money order are all acceptable forms of payment. All payments made by check should be made payable to Teeming River Cruises. There is a $50 fee for returned checks. Wire Transfers and Debit Cards are not acceptable. Third-party credit cards are not acceptable. All payments made within 30 days of departure must be made by credit card. Reservation Down-Payment must be made on Guests’ credit card. The remaining balance is payable by “cash” (i.e. personal check, cashier’s check, certified bank check or money order) to take advantage of the cash discount (5% discount); or by credit card (no cash discount). The total quoted is the no cash discount price. If you pay the remaining balance via “cash”, you will receive the cash discount price and the “No Cash Discount Adj” fee will be removed. Some credit card companies may impose a “Foreign Transaction Fee” even though your transaction is denominated in US dollars. This fee is an arbitrary fee that may occur in a small number of cases, accruing wholly to the credit card issuing bank. Teeming River Cruises does not control these bank-imposed fees nor does Teeming River Cruises derive any benefit whatsoever from them; we are therefore unable to accept responsibility for the fees. Passengers are responsible for verifying that everything on their invoice is accurate and complete, including names of passengers, dates of travel, options selected. Note each name must match the relevant passport. Teeming River Cruises cannot accept responsibility if we are not notified of inaccuracies within 5 days of sending out the TeemingRC Confirmation. Changes are subject to the charges and penalties noted below. In the case of billing errors, Teeming River Cruises reserves the right to re-invoice the passenger with correct pricing. Changes to an existing reservation, whatever the cause, are subject to a $50 per person charge plus any additional supplier fees. This includes name changes. Changes or additions after departure are subject to local rates at the time of change and in some cases must be paid directly by the passenger to the service provider. There are no changes or refunds for excursions or other additional services. There are no refunds for unused services. Teeming River Cruises does not make your airfare reservations. Passengers must make their own flight arrangements. Teeming River Cruises will not be responsible for late arrivals or missed transfers due to delayed or canceled flights, for missed cruise/trip days, or any resulting extra costs from the above scenarios. Passengers must make their own transfer arrangements. Teeming River Cruises and/or the shipowner shall not be answerable for the loss of or damage to valuable items (such as money, legal documents, identity papers, jewelry, keys, medical products and other personal property). We kindly request you not to leave valuable items unattended. Furthermore, we recommend you not to leave in your luggage you have entrusted to carriers any such valuable items. Teeming River Cruises cannot be held responsible in the event of damage to, loss of or theft of personal effects. Teeming River Cruises has no baggage limit aboard the vessel, however, all passengers’ bags must fit in their cabin without obstructing access in and around the cabin. Airlines may have additional baggage restrictions and may impose additional fees for checked baggage and/or excess baggage. Additional taxes and surcharges may be collected by foreign government and non-government entities. Passengers must keep an eye on their baggage—it is their responsibility throughout the trip. Teeming River Cruises is not responsible for loss, theft, or damage to baggage and/or personal belongings at any time during the cruise or cruise/tour, or on included transfers and other transportation. Prior to departure, passengers are advised to double check all drawers, closets, safe, under the bed and in cabinets to ensure no personal items are left behind. It is cost prohibitive to return left behind items. A protection plan covering lost, stolen or damaged baggage can be secured by purchasing travel insurance. Teeming River Cruises will email passengers a confirmation when initial payment and final payments are made. All additional information will be emailed to passengers. A hard copy will not be mailed. Passengers are responsible for ensuring that they have the proper travel documents and are obligated to check with the respective consulate(s) or the visa agency to determine whether any visas or passports are required. Typically countries require passports to be valid for at least 6 months after the scheduled return date of the trip. Teeming River Cruises strongly advises all passengers to observe these guidelines. Some countries may require a full blank page in the passport for stamping purposes. For more information please contact the appropriate government agency. Non-US citizens should check with the respective consulate of the country(s) to be visited for current entry requirements. Please be aware that the process of obtaining a passport may take up to 3 months. Teeming River Cruises strongly advises all passengers to observe the above passport/visas guidelines. Teeming River Cruises makes every effort to ensure that passenger’s trip is safe and enjoyable. However, situations beyond our and their control may occur. We wish our passengers never had to cancel or interrupt their cruise, but occasionally things beyond their control force them to change their plans. We strongly recommend you purchase travel insurance. To help provide you with some peace of mind, Teeming River Cruises has teamed up with RoamRight, a leading Travel Insurance Company to offer a comprehensive plan to address many travel concerns such as trip cancellation and interruption, lost and delayed baggage benefits, coverage for pre-existing conditions when purchased within 21 days of initial trip deposit, and emergency medical coverage. Keep in mind that as the passenger, your health plan coverage for a stay outside the US may be limited. The vacation participant agrees that neither the Teeming River Cruises nor its affiliates shall be liable for any damage, loss (including personal injury, death, and property loss), or expense occasioned by any act or omission of any supplier providing services, any insurer or insurance administrator under the Travel Protection plan, or any other person. Passengers can count on the value of Teeming River Cruises’ experience and regional knowledge to make sure they enjoy their cruise-tour even when conditions beyond our control occur. The very nature of a river, its sources, and networks of bridges and locks means that there will be times when weather or other conditions in a region require Teeming River Cruises to make adjustments and/or modifications to an itinerary. Although every effort will be made to keep itineraries and tour packages as presented, Teeming River Cruises reserves the right to substitute itineraries or tour packages. In such cases, we will do everything we can to make sure the locations visited, the shore excursions taken and the hotels or vessels offered are like the ones originally arranged. National monuments and tourist sites regularly undergo renovations, which can obscure views of the site. No tour will be canceled due to renovations; however, Teeming River Cruises will determine based on the conditions if the itinerary needs amending. Any changes to itineraries will not result in eligibility for a refund. Itineraries are subject to change without notice and may need to be altered specifically because of water levels, wind factors, or other conditions. Passengers who choose to cancel or interrupt their cruise or cruise-tour due to an itinerary change will not be issued a refund. For technical or operational reasons, river companies or shipowners may assign a passenger a cabin other than the one set or chosen upon the reservation. In that event, the new allotted cabin should be at least in the same classification. Such change shall not be considered a valid cancellation reason for the client, nor a significant change in the contract and shall entitle no compensation. Optional shore excursions presented on Teeming River Cruises’ website are offered through local service providers and are independent of Teeming River Cruises. Teeming River Cruises reserves the right to reschedule and/or cancel any shore excursions if the minimum number of participants is not met or for other circumstances (including but not limited to weather, safety, closure of sites by local authorities and strikes). If passengers choose to cancel their reserved shore excursion, there will be no refund given. Although Teeming River Cruises itineraries contain recommendations for optional port excursions and/or activities for passenger’s leisure time; these suggestions do not constitute an endorsement of any specific service provider, regardless if Teeming River Cruises suggested the local providers and/or assisted the passengers in the booking process with said provider. The decision to participate in any such shore excursions or leisure activities should be made independently and with due consideration. Accordingly, Teeming River Cruises has no liability for any optional shore excursion or suggested activities (including any acts or omissions of operators, organizers, agents or employees associated with these excursions and activities). Bicycles are loaned out and not for rent. It is the responsibility of the passenger to check-out the bicycle condition BEFORE setting out on any ride. Customer accepts the use of the equipment, AS IS. Customer accepts full responsibility for the care of the equipment while under his/her possession. Assumption of Risk: I understand and accept that bicycle usage exposes me/my child to many hazards that may entail an unavoidable risk of death, personal injury (including but not limited to severe spinal or head injury) and loss of or damage to property. I also understand I/my child should be in good physical health to participate in bicycling, and I confirm that I/my child have no significant health issues that prevent me/my child from participating in bicycling. I/my child have no medical conditions, nor have I/my child been diagnosed with a condition that prevents me from bicycling. In spite of the aforementioned risks and acknowledgments, I hereby assume all risk of injury or loss of life to myself/my child and loss of or damage to property arising out of using this bicycle and participating in bicycling. I understand the inherent risk involved in using this bicycling equipment and accept full responsibility for any and all such damage or injury which may result. Waiver And Release: In consideration of Teeming River Cruises loaning me/my child this bicycle, I specifically release and forever discharge Teeming River Cruises and its affiliates, officers, agents, and employees from any and all liability or claims for injury, illness, death or loss of or damage to property which I/my child may suffer while using this bicycle and participating in bicycling. This discharge specifically includes, but is not limited to, liability or claims for injury, illness, death or damage caused by the negligence of Teeming River Cruises or its affiliates, officers, agents, or employees. It is my intent by the Waiver and Release Agreement to release Teeming River Cruises and hold it harmless from all liability for any such property loss or damage, personal injury or loss of life, whether caused by the negligence of Teeming River Cruises or whether based upon breach of contract, breach of warranty, or any other legal theory. In signing this document, I fully recognize that if injury, illness, death or damage occurs to me/my child while I am engaged in using this bicycle or participating in bicycling, I will have no right to make a claim or file a lawsuit against Teeming River Cruises or its affiliates, officers, agents or employees, even if they or any of them negligently cause my injury/my child’s injury, illness, death or damage. I HAVE CAREFULLY READ THIS AGREEMENT IN ITS ENTIRETY AND UNDERSTAND ITS CONTENT. I AM AWARE THIS IS AN ASSUMPTION OF RISK, WAIVER, AND RELEASE OF LIABILITY AND I SIGN IT VOLUNTARILY. I ALSO UNDERSTAND THAT I SHOULD NOT AND MAY NOT PARTICIPATE IN THIS ACTIVITY IF I AM UNDER THE INFLUENCE OF ALCOHOL OR DRUGS. On stopovers at ports, the latest time for returning to the vessel along with the departure time of the vessel are announced on board. Passengers are responsible to observe and abide by the appointed times. Teeming River Cruises has no liability in the event of failure of passengers to board at the stipulated time. No refund or compensation shall be payable to the passenger for any losses incurred due to their failure to board on time. Teeming River Cruises reserves the right to cancel, advance or postpone any scheduled sailing date and may, but is not obligated to, substitute hotels or vessels. Teeming River Cruises shall not be liable for any loss to passengers because of any such cancellation, advancement or postponement. In the event of cancellation by Teeming River Cruises, passengers’ sole right of recourse shall be to obtain a refund of monies paid to Teeming River Cruises. Passengers must follow the instructions of Teeming River Cruises, its affiliates, crew members and local service providers at all times to ensure safety on the vessel, at ports, and on shore excursions. Weapons of any kind are not permitted on board the Teeming River Cruises vessel or on escorted shore excursions. Passengers should be mindful that during their participation on vacations conducted by Teeming River Cruises, inherent risks and dangers may occur beyond the company’s control (including, but not limited to, political unrest; terrorism; acts of lawlessness; accident or illness in isolated regions lacking the means of rapid evacuation or medical facilities; the hazards of traveling in foreign territories; and acts of God). Teeming River Cruises is not responsible or liable for any such risks and dangers. Furthermore, Teeming River Cruises will not have liability regarding the availability, accessibility, provision, or adequacy of any medical care provided. By agreeing to participate in a tour, vacation and/or optional shore excursions offered through Teeming River Cruises, passengers agree that they will hold Teeming River Cruises harmless for any such provision of medical care or services. Payment of passengers’ deposit indicates acceptance of the associated safety and security risks and dangers, as well as passengers’ agreement to hold Teeming River Cruises harmless from these aforementioned risks and dangers. Security, along with safety, is a major concern to Teeming River Cruises and the situation globally is continually shifting. Events around the world, coupled with the Travel Advisories issued by the US Government, may at times necessitate changes to the itinerary or even trip cancellation. Risks are involved in travel to any country and passengers could experience security difficulties. Passengers must accept these risks and assume responsibility for their own travel decisions. For full enjoyment of Teeming River Cruises vacations, passengers should select a trip that is well suited to their physical health and abilities. Passengers who require any form of assistance due to physical handicaps like sight or hearing impairments are required to notify Teeming River Cruises prior to booking. Furthermore, potential passengers are advised that individuals with heart disease, chronic illness, advanced pregnancy, or mental illness are not well suited to participate in these demanding travel itineraries. When notified of any such health condition or disability, Teeming River Cruises will require a medical condition form filled out and signed by passenger’s physician. Teeming River Cruises reserves the right to reject a potential passenger from the cruise and/or remove any person from a tour due to the failure of the passenger to provide required notification and/or when, in our sole judgment, continued participation would considerably impede the services to be provided to all passengers. To participate in all tours, passengers must be able to understand and follow instructions given by the cruise director or tour guides to ensure their safety, as well as, the successful operation of the tour. Teeming River Cruises reserves the right to remove or quarantine any passenger from the group who arrives at the destination showing signs of illness or who becomes ill during the tour, thereby posing a threat to the health and safety of other participants. This removal or quarantine will be at the sole discretion of Teeming River Cruises and/or their representatives, the ship’s captain or local tour operators. The ill passenger will be directed to a local medical facility for examination. Only upon clearance by an accredited medical facility or licensed health practitioner (verifying the passenger’s fitness to travel without posing a health or safety threat to fellow passengers) will the passenger be permitted to resume group activities. All expenses and any losses incurred as a result of the medical treatment and services (including but not limited to examination, diagnosis, treatment, any other medically-related charges, additional hotel stays and related transportation, meals and alternate travel plans) will be the sole responsibility of the said passenger. Teeming River Cruises does not employ medical personnel or have specialized facilities. Any required medical attention will be administered by a local facility at the passenger’s expense. Teeming River Cruises cannot guarantee the availability or quality of local medical services or facilities. Resulting charges will be the sole responsibility of the passenger. Teeming River Cruises endeavors to provide a safe, enjoyable, and memorable travel experience for all passengers. Unfortunately, Teeming River Cruises is not equipped or staffed to provide personal services (such as assistance walking, getting on and off the ship, coaches or other forms of transportation, etc.). Likewise, tour operators, guides, drivers or hotel personnel are not able to provide such assistance. A qualified and able body companion should accompany passengers who need such individual assistance. Passengers must report to Teeming River Cruises at the time of reservation any mobility issues. Passengers should be aware that most tours include rough terrain, extensive walking over cobblestone streets, uneven pavement, steps and locations which may not be easily accessible. We recommend passengers wear footwear suitable for time on board the ship and for excursions with non-slip soles. In the interests of group harmony, passengers should be able to maintain the pace of the tour. Passengers with special needs would be better served independently, scheduling private tours more suitable to their level of mobility. This is an international tour. Hotels and river cruises outside of the United States are not required to comply with ADA requirements and therefore may not have ramps, wide entryways or elevators to accommodate disabled passengers or devices such as wheelchairs, walkers, and motorized scooters. Due to physical constraints and space limitations, wheelchairs, walkers, and motorized scooters may not be taken aboard motor coaches and river cruises. Furthermore, service animals cannot be accommodated on international escorted tours. Passengers who are less than 18 years of age must be accompanied and share a stateroom with a parent, legal guardian or other responsible adults over age 21. Adults accompanying children are responsible for their behavior onboard and onshore. There are no connecting cabins on Teeming River Cruises. Children under 8 years of age are not allowed on any Teeming River Cruises. There are no discounts given to young travelers on Teeming River Cruises. We reserve the right to limit the number of minors under the age of 18 both on board and on optional excursions booked through Teeming River Cruises. Due to heightened security, many countries have adopted practices to prevent international abductions of children. If a child will be traveling with adults other than the parents or with only one parent, it is recommended that a notarized letter is written by the parents or non-traveling parent granting authorization to travel, including the dates of travel. We suggest that passengers also contact the appropriate consulate and airlines, as they may have additional requirements or recommendations. For the comfort of all our passengers, smoking is only permitted in the specifically designated area of our ships. Smoking is not permitted on motorcoaches or any group excursions. This policy applies to all forms of smoking materials including vapor e-cigarettes, cigars, and pipes. Marijuana (whether legal or illegal) or any other illegal drug is strictly prohibited onboard. Please note while Teeming River Cruises attempts to minimize noise and vibrations on board the ship, passengers understand that some noises and vibrations may be experienced while on board and agrees that Teeming River Cruises cannot be held responsible for such noise and vibrations. Please be advised that Teeming River Cruises cannot accommodate specific or special diets. Small ships have limited choices aboard and we cannot create or maintain a special menu for passengers’ diet. Pets, including service animals, are not permitted on Teeming River Cruises trips. Please note that the official language on board ship and on shore excursions is English. All Cruise Directors, Hosts, and Local Guides speak English, and all ship commentary is conducted in English. For maximum enjoyment and understanding, and for safety, passengers should be able to read, understand, and speak English. Trip participants grant Teeming River Cruises permission to photograph and video events during the vacation and cruise to be used for promotional or commercial use without payment of any compensation to the participant. Teeming River Cruises or the ship’s captain or operator may at their sole discretion deny boarding and transport to any passenger. Moreover, Teeming River Cruises has the authority to remove any passenger who they reasonably believe to be a danger to himself or herself or to others or is threatening to engage in behavior which may negatively affect the safety, security, enjoyment, or comfort of other passengers or crew members (such as participating in any illegal activity, being verbally or physically abusive, disruptive, obscene, obnoxious, harassing, or discriminatory). Likewise, failure or refusal of the passenger to follow Teeming River Cruises and its representatives and crew members’ rules, procedures or instructions is grounds for immediate removal from the ship or tour. In the event a passenger is denied boarding or removed; such passenger may be left at any port or location without any liability to Teeming River Cruises or any of its related entities. The passenger will not be entitled to any refund, payment, compensation or credit of any kind for unused or missed trip services or charges incurred resulting from the termination of the travel arrangements with Teeming River Cruises. In addition, the passenger will be responsible for their travel costs to return back home. Teeming River Cruises shall be entitled to recover from the passenger any expenses incurred due to their denied boarding or removal. Passengers should bear in mind, that during both local and national holidays, certain days of the week, for special events, and during religious occasions, certain attractions and facilities (such as museums, churches, sightseeing tours, restaurants, and shops) may be closed to the public. During peak seasons, entrance to some attractions and sites may be limited or not available. Alternatives will be offered whenever possible. Teeming River Cruises cannot be held responsible for any closures, required itinerary changes, or modifications for any reason. It is customary for passengers to give cruise gratuities, subject to their satisfaction with the services rendered. Gratuities for their Cruise Director, Local Hosts, Local Guides, Driver, and Ship’s Crew are not included in the cruise price and are discretionary. Passengers should refer to the onboard program for suggested tipping amounts. Local authorities are responsible for assigning docking positions at each port. Consequently, Teeming River Cruises and other river cruise companies have no control over where they can dock. At times this can result in double docking (i.e. where more than one ship is assigned to the same dock and ships are rafted together), which may temporarily block some views and make access to and from the ship more difficult. Teeming River Cruises will not be responsible for any accessibility problems or inconveniences associated with the ship’s docking assignment. Neither Teeming River Cruises nor the owners or operators of the vessels shall be liable for delay or inability to sail or perform due to any condition caused by or arising from water level, drought, flooding, severe weather, other acts of God, peril of navigation, repair or maintenance on the river (such as locks, docks or bridges), strikes, civil or labor issues, lockout, fire, explosion, collision, vessel breakdown or damage to the vessel. Neither shall they be responsible for issues caused by or arising from civil commotion, riot, insurrection, war, government restraint, requisitioning of the vessel, political disturbance, acts or threats of terrorism, epidemics, inability to secure or failure of supplies including fuel, and/or other circumstances beyond Teeming River Cruises control. In such cases, part or all of the cruise itinerary may be operated by motor coach and accommodations provided by hotels. If this becomes necessary, Teeming River Cruises will endeavor to provide equal or similar services, however, no tour will be canceled and no monetary compensation will be made for those changes. On board the ship, Wi-Fi connectivity is offered by an independent third party with separate Terms & Conditions of usage. Wi-Fi connectivity is not guaranteed, may be unavailable, is often disrupted and slower on board. Passengers will not be able to download or stream movies or most video. Onboard Wi-Fi will be best for emails and texting. In many cases, the bandwidth cannot support Skype or other types of calling services or apps. Personal information supplied when requesting information or booking (from the initial inquiry, booking, during the vacation and beyond) is collected by Teeming River Cruises. This data may be used to assist travelers with their vacation arrangements and will be necessary to properly process the passenger’s reservation and tours with Teeming River Cruises and their suppliers. These details include but are not limited to passenger’s full name, address, date of birth, credit card information, passport number and expiration date and any medical conditions or disabilities disclosed to Teeming River Cruises. Failure of passengers to fully and accurately supply the details may result in the passenger’s trip being interrupted or canceled. There are no refunds for passenger’s failure to provide information by the required time. Teeming River Cruises may be required to transmit these details to other authorities or foreign countries in which the data protection and privacy laws are less rigorous than ours. Passengers, by virtue of booking with Teeming River Cruises, agree to the company using, storing and transmitting this data to other third parties for the above-specified reasons. Passengers agree to not hold Teeming River Cruises liable for the usage and protection of the aforementioned data. Please note that, in addition to Teeming River Cruises contacting passengers in relation to their travel arrangements, they may also contact passengers following their vacation with details of other vacation opportunities/tours provided by Teeming River Cruises that may be of interest to previous passengers (unless informed by passenger of their preference to not receive such future opportunities). 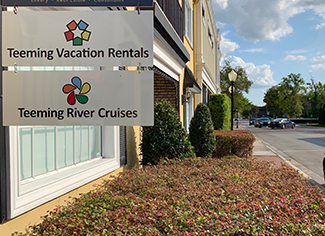 Teeming River Cruises may use an affiliated company, such as Teeming Vacation Rentals, in processing passengers’ payments, however, passengers have no contractual relationship with any entity other than Teeming River Cruises. Teeming River Cruises LLC, its employees, directors, officers, successors, agents, assigns, affiliates, and shareholders (collectively Teeming River Cruises) is an independent company and does not own or operate any of the vessels or transportation and any other provider of goods or services for passengers’ trip (including but not limited to vessels, hotels or other lodging facilities, airline, bus, van or other transportation companies, local ground operators, providers or organizers of optional shore excursions or equipment used thereon, food service or entertainment providers, etc.). All such operators, agents, persons, and entities are independent contractors. Consequently, Teeming River Cruises is not liable for any negligent or willful act or failure to act of any such person or entity, or of any other associated third party. Teeming River Cruises is not responsible for any injury, damage, or loss to person or property, death, delay or inconvenience in connection with any of the provided goods or services regardless of cause or whether or not services are tendered or transportation is arranged through Teeming River Cruises. These circumstances include but are not limited to inability to sail, structural or other defective conditions in the vessel, mechanical or other failure of any means of transportation or for any failure of any transportation to arrive or depart timely or safely, overbooking or downgrading of accommodations, lack of access to or quality of medical care, difficulty in evacuation in case of a medical or other emergency, illness, epidemics, food poisoning, incidents due to recreational activities such as swimming, kayaking, sailing, canoeing, rafting, hiking, walking, bicycling, etc., diseases and dangers associated with or bites from pests or insects, animals, marine life or vegetation of any sort, sanitation problems, or for any other cause beyond the direct control of Teeming River Cruises. Passengers agree to release Teeming River Cruises from any and all claims for any loss, delay or damage resulting out of the acts, omissions or negligence of Teeming River Cruises, any of their suppliers or independent contractors. Passengers assume all risk thereof. All arrangements made for tour participants with independent contractors are made solely for convenience to participants and are done at the participants’ own risk. Teeming River Cruises and all Suppliers specifically disclaim all liability for damages for psychological injury, mental suffering or emotional distress of any kind, except to the extent prohibited by the applicable law, including without limitation, 46 U.S.C. Chapter 305 – Exoneration and Limitation of Liability. Tickets, vouchers, and any other travel documents are subject to all terms and conditions of the respective Suppliers (some of which could limit Supplier’s liability). Under no circumstances shall Teeming River Cruises be construed as a carrier under a contract for safe carriage of the guest or his or her belongings. Teeming River Cruises, owners of the vessels and the Suppliers shall be entitled to any and all liability limitations, immunities and rights applicable to them or any of them under the Strasbourg Convention on the Limitation of Liability of Owners of Inland Navigation Vessels (CLNI), with protocols and amendments, together with the further provisions of the International Convention of Limitation of Liability for Maritime Claims, 1976, with revisions and amendments (hereinafter collectively referred to as the “Convention”), if and as applicable, and by those other and further limitations of liability set forth in the statutory and general maritime law of the United States, (including the aforementioned 46 U.S.C. 305), as well as any other applicable nation’s laws limiting liability. Teeming River Cruises and the Suppliers shall be entitled to claim the benefit of whichever law, treaty, regulation or doctrine provides the greatest legal protections to Teeming River Cruises and the Suppliers. Passengers are aware that travel such as that they are participating in with Teeming River Cruises may involve hazardous activities, with a risk of illness, injury or death which may be caused by forces of nature, insects or flora, animals, the negligence of Teeming River Cruises, or other persons and entities known or unknown, or of criminal or willful conduct of third parties. Passengers are aware that weather conditions may be unpleasant, adverse and/or even severe. Passengers are also aware that medical services or facilities may not be readily available or accessible during some or all of the time during which they are participating on the vacation. As part of partaking in this trip, passengers should be willing to accept the risks and uncertainty involved as being an integral part of their vacation. Passengers hereby accept and assume full responsibility for any and all risks of loss, illness, injury or death and of the negligence of Teeming River Cruises, agreeing to hold harmless and release Teeming River Cruises from claims of third-party negligence. Passengers understand the physical requirements of the activities in which they will be participating as noted in the above Mobility section of this Agreement, and currently have no known physical, medical or mental condition which would interfere with their ability to participate in the tour or affect their safety in such activities. Accordingly, passengers will assume all risks that may be created, directly or indirectly, by any such condition. Passengers hereby authorize Teeming River Cruises or the local Suppliers or others to arrange for any emergency medical treatment and/or hospitalization as may be necessary for them because of participation in any such activity without passengers’ further consent. Any dispute between the vacation participant and Teeming River Cruises (referred to as “Company”), directly or indirectly relating to the Terms & Conditions and/or to the vacation undertaken, shall be first submitted to mediation in Orange County, Florida, before a mediator mutually agreed to by the parties. If mediation is not successful, then the dispute shall be resolved by binding arbitration under Florida law before the American Arbitration Association or its successor. The Arbitration against the Company or the vacation participant shall be invoked in writing under the laws of the State of Florida within a period of 12 months following the date of completion of the vacation and not later. Neither of the parties nor any affiliate of the Company shall, in any case, be liable for other than compensatory damages, and they hereby waive any right to claim punitive damages. Florida law governs this contract and all arbitration or other proceedings arising out of or related to this agreement. Any action to enforce the arbitrator’s decision shall be brought only and exclusively in the state or federal courts in the State of Florida, USA. No person, other than an authorized representative of the Company by a document in writing, is authorized to vary, add, or waive any term or condition on its brochure or website, including any term or condition set forth in the preceding provisions. Teeming River Cruises is not responsible for omissions, printing and/or presentation errors in brochures, on Internet sites, or in any other media where such information may be presented. Teeming River Cruises reserves the right to make corrections as required. Trademarks, trade names and logos of Teeming River Cruises and its affiliates and related companies (including but not limited to Teeming River Cruises, Teeming Vacation Rentals and/or Teeming Travel) appearing on Teeming River Cruises website or marketing are trademarks owned and/or applied for and/or registered by Teeming River Cruises and/or Teeming Vacation Rentals. Teeming River Cruises, LLC is an affiliate of Teeming Vacation Rentals, LLC. I have carefully read these Terms and Conditions and the booking information sections of this document, and fully understand its contents. I am aware that this is a release of liability and a contract between myself as the passenger and Teeming River Cruises and agree of my own free will. By checking the Passenger Agreement box, I agree to these Travel Terms & Conditions and Teeming River Cruises’ Release from Liability, Assumption of Risk and Binding Arbitration Clause for myself, each member of my traveling party and any minor children accompanying me.